Recent violence in Louisville has thankfully started many public conversations about poverty, education and culture that otherwise be relegated to quiet, resigned laments at the dinner table. That Louisvillians are talking about this publicly is broadly to the good. Unfortunately, one well-worn claim about How We Got Here doesn’t stand up to basic scrutiny. We used to pay for real educators and leaders spending the time to teach youth who are currently neglected and forgotten. We used to have career and vocational programs for kids who aren’t necessarily college material – I know plenty of successful adults today who learned a trade in high school, anything from auto mechanics to printing to agriculture. Today, if you’re not college-bound, an athlete, or an entertainer, you are entirely on your own to find a trade or a career – no wonder ‘pro athlete’ and ‘gangsta rapper’ are the only goals of so many children. Kids don’t learn that there is success in working for a living – in our culture, in our education systems, in the media, either you are fabulously wealthy or you are nothing. I include the latter part about vocational education because I agree with it almost entirely. The median salary for plumbers in America is about $49,000. @cobrown You cannot be serious. My county is so short of funds they haven't had textbooks since 2003. Schools are flat broke. This doesn’t include the costs associated with school buildings, btw. It’s a powerful testament to the power of public school salesmanship and media handwringing that the most carefully considered, thoughtful answer to basically any problem with public schools must always be, say it with me, More Funding. 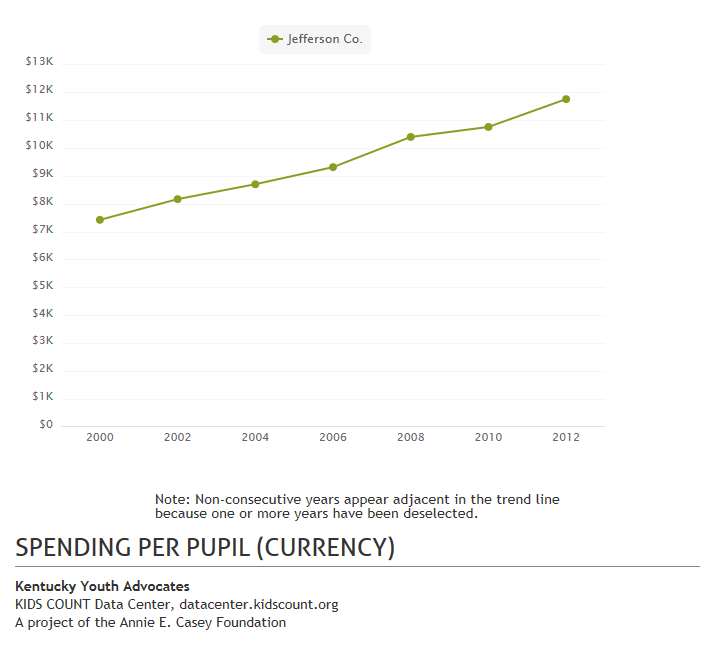 It’s past time Kentuckians admitted that More Funding has been tried for decades. The persistent problems of low proficiency in reading and math in Jefferson county (despite decades of More Funding) should be laid squarely at the feet of the public school establishment and its defenders. Kentucky is among a shrinking number of states with no charter schools and no private school choice. This, too, is a testament to the power of the public school establishment that has fought to keep students in failing schools. But let’s be clear: School choice is not the silver bullet cure to my hometown’s violence. It is, however, a powerful way to engage parents in making one of the most important decisions on behalf of their children that they’ll ever make. If a robust transfer of power away from public schools and into the hands of low-income parents isn’t on the table, then I think it’s safe to call that intentional oversight yet another testament to the power of the public school establishment. @cobrown nicely written but I disagree. Zero evidence that choice in schools improves school districts. I say ban private schools entirely. If the betterment of school district performance were the only relevant metric for school choice … Tim would still be mistaken. Also, does anyone honestly care about school districts? Better to worry about how kids currently trapped in those districts get educated.